Bianchi Fizik Aliante Delta Saddle White/Celeste 2014 is the choice of enthusiast riders. High performance reinforced shell.Twin flex graphite shell. Lightweight and comfortable. Ergonomic dip platform. Aliante Delta is for The Bull: Rigid Spine. 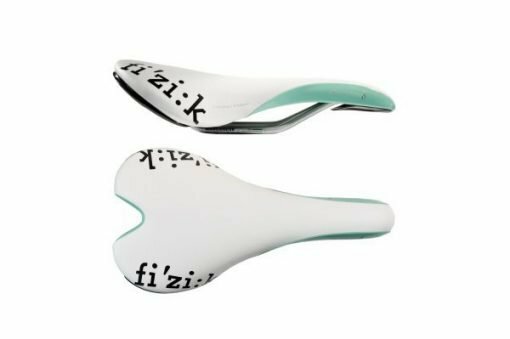 Fi’zi:k is the premium, racing brand of Selle Royal S.p.a. Its name is synonymous with the shape and form of the human body; hence the intuitive association with products that are contact points between riders and their bikes. More than this, fi’zi:k represents beauty, speed, passion, freedom for those who race against each other, race against the clock and for enthusiast cyclists around the world who identify with the feeling of the fire of competition. The humble origin in 1998 stemmed from a vision to improve rider performance by creating superior saddle comfort. Today’s Spine Concept™ provides a guideline to help riders find their most comfortable saddle. Integral to this comfort is the design collaboration with professional athletes and the fact that each saddle is 100% “fatto a mano” (hand-made) in Italy. Some credit Fi’zi:k with redefining the racing saddle category thanks to its destructively-innovative elegant products that are not only comfortable, but also a source of style and beauty in their own right. The Arione, launched in 2003 is one such example. In 2006 fi’zi:k launched a product for riders’ hands: a strong, washable Microtex bar tape. Shoes were then launched in 2010 offering a unique blend of innovative materials with an inimitable style. 2014 sees fi’zi:k launch road cockpit components employing The Spine Concept™ to help riders choose their perfect handlebar shape. In 2013 fi’zi:k saddles were ridden by 8 out of the 19 UCI World Tour Teams. Fi’zi:k’s relentless innovation is facilitated by many such committed professional athletes, from all cycling disciplines. Relentless testing and refinement has helped fi’zi:k to push the boundaries of possibility. It will come as little surprise then that Fi’zi:k products have been ridden to many Cycling World titles, Ironman World Championship titles and beyond.